Do these phrases sound familiar? Our media bombards us with these messages almost daily. In fact we have heard them so often, many times without solutions, that we have begun to tune them out or have become paralyzed by the overwhelming scope of the problem. Whatever the reason for our inaction, these crises are not any less real to those affected by them, especially for those students who everyday are faced with limited prospects simply because of the way their brain works. 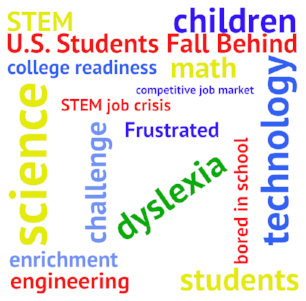 Every day our educational system is contributing to the widening achievement gap and denying access to the STEM pipeline for millions of our students, those students who have the learning difference known as dyslexia. Currently in the United States, 15-20% of our students have dyslexia, yet our elementary school reading curriculum is not appropriate for these learners due to the fact that they, “…simply are not able to categorize the sounds of language or connect sound to meaning in the same way as other students.” (Marshall, 2013) In the early grades especially, the curriculum takes up the majority of learning time, leaving these students feeling isolated and unintelligent, ultimately losing confidence and the joy of learning. Faced with less than ideal prospects, these students are denied access to so many pathways to success and in some cases turn to a life of crime evident in the fact that 48% of our current prison population is dyslexic. Simultaneously, these students are not exposed to subjects that many of them would excel in, namely science, math, engineering and technology, or STEM. Studies show that many people with dyslexia gravitate to these fields. In fact, as Moskal (2014) states, “some researchers speculate that these brain differences, which result in challenges to language development, may provide dyslexic students with an advantage in STEM." Referencing Davis and Braun (2010) in “The Gift of Dyslexia”, Moskal explains the difference between two-dimensional and three-dimensional reasoning, the latter used by many dyslexic students in problem solving. Dyslexic students are more flexible in their ability to look at problems from different angles without changing their own position, a skill which is helpful in physical science but creates reading challenges in that a change in angles quickly turns a "b" into a number of other letters. According to a 2016 Forbes publication, these are 10 companies with the largest number of STEM related job openings. So, what if instead of shuttling these students through the door leading to poverty, limited opportunity, and in some cases prison, we slid that door closed and opened one leading to a life filled with following their passion? At SDSquared we seek to do just that. We target students who are denied access to both the remediation and enrichment in STEM by their lower-income status or whose families are unable to provide these things on their own for a variety of reasons. Our goal in doing this is to simultaneously close the achievement gap and fill the STEM pipeline.